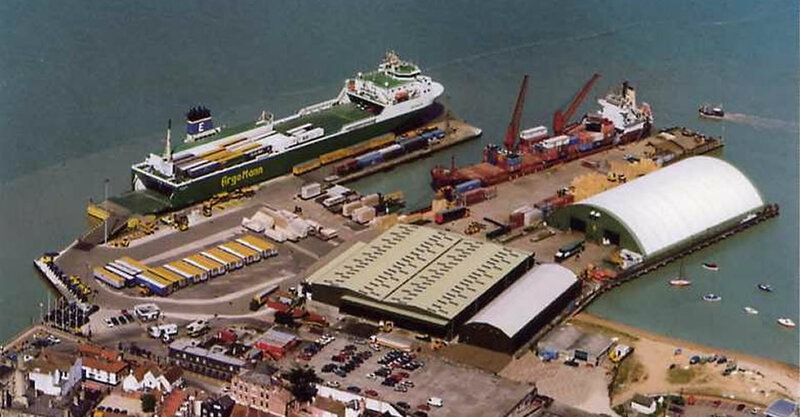 The Navyard Wharf is operated by the Harwich Dock Company Ltd. Roll on/Roll off cargo ships sail to various ports in Finland, Sweden, Norway, Denmark and Belgium. Previously this was the site of the shipyard and before that the site of a small 12th Century castle. 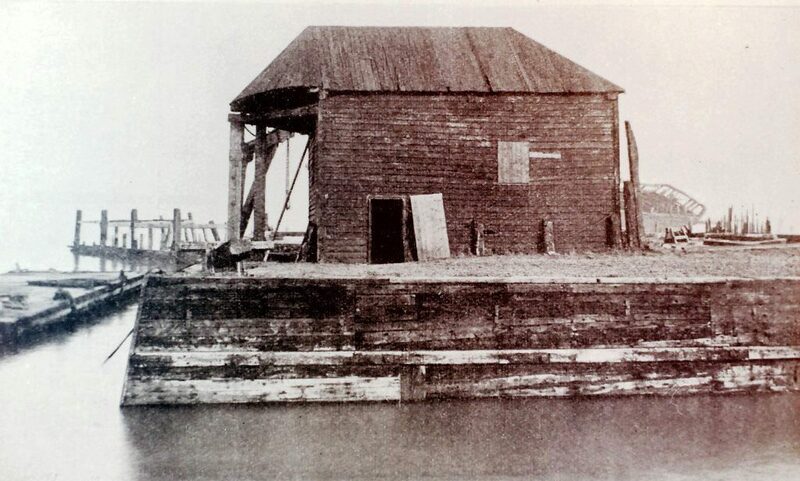 Ships were built here in the 16th Century under Chapman and Pett. Elizabeth 1 came to inspect the shipyard in 1561. She stayed at the noblest house in the middle of the High St (now King’s Head St). It was a medieval aisled hall possibly the Duke of Norfolk’s. 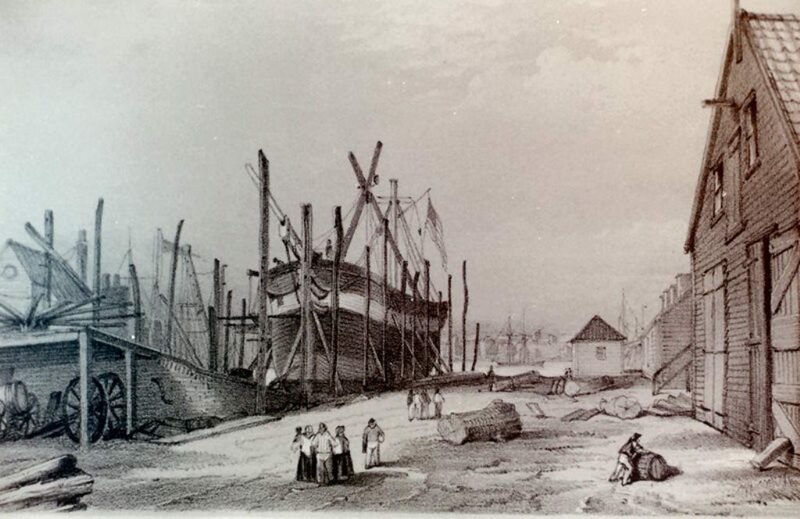 Originally known as King’s yard as it passed out of naval hands in 1713. from that time the Royal Naval yard was leased to various private operators who continued to build and repair naval and private vessels. A list of the Men of War constructed in the Old Naval Yard 1660-1827 is shown on a board near the entrance to the Navyard Wharf. here is also situated the old shipyard bell which was cast by John Darby, Bell founder of Ipswich in 1666. It was housed in a bell tower in the middle of the Old Naval Yard and rung daily to summon people to work. It was disposed of in the late 1920s. The Treadwheel Crane, now situated on Harwich Green, The earliest known reference to a crane of this type was by the Romans in 25 B.C. By the Middle Ages, such cranes were common in this country. However, by the end of the 17th Century/beginning of the 18th Century, these cranes had only one drum and the power was supplied by a donkey. As far as is known Harwich has the only British example of a two-wheel man operated Treadwheel crane. In the 1720’s the writer Daniel Defoe visited Harwich and he said it was ‘a town of hurry and business, not much of gaiety and pleasure; yet the inhabitants seem warm in their nests and some of them are very rich’. Defoe was also impressed by Harwich harbour. He said it was ‘able to receive the biggest ships and the greatest number that ever the world saw together’.